Join us online for our monthly women's networking series, After 6: Career Conversations. This month we are discussing Love and Relationships, with our special guest author, Joi-Marie McKenzie. After 6 is a chance for you to connect with other like-minded women. 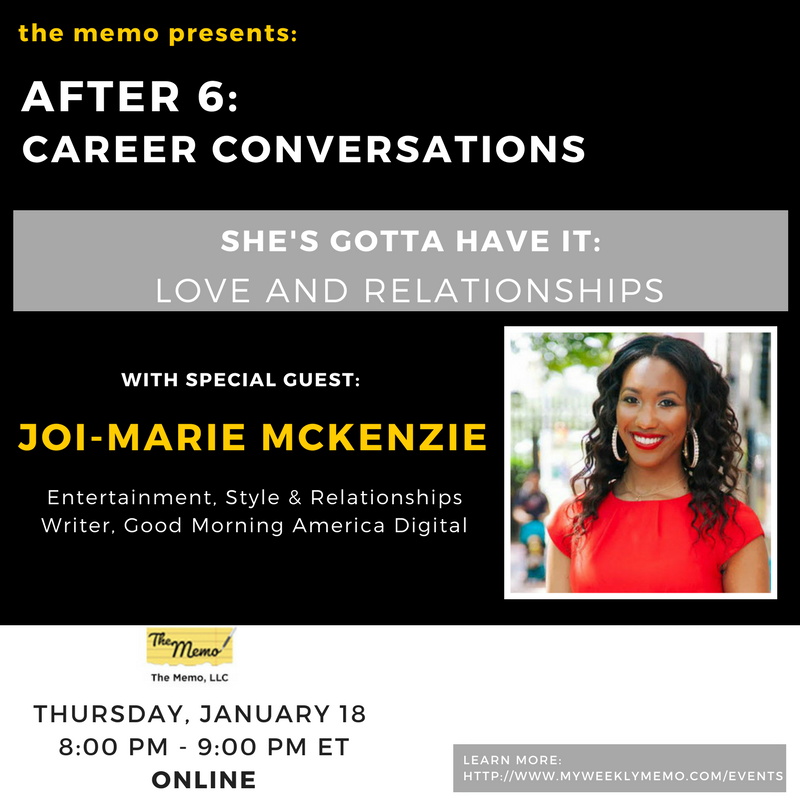 Joi-Marie McKenzie is an entertainment, style and relationships writer for Good Morning America. She is also the author of The Engagement Game, published by Hachette Book Group. McKenzie scored her book deal by happenstance — after sending 20 pages of her memoir to an editor for feedback that editor turned around and offered her a deal. McKenzie is also the creator of The Fab Empire, an award-winning website that covers society, celebrities and local events in various cities around the U.S. Previously, she has freelanced for publications including her family’s newspaper, The Afro American, Clutch Magazine, NBC New York and NBC Washington. McKenzie is an in-demand panelist and workshop facilitator. She has spoken at Columbia University, University of Maryland College Park, Howard University, LIM College, Blogger Week, and Blogalicious. McKenzie attained a Master of Science in Digital Media from Columbia University’s Graduate School of Journalism and a Bachelor of Arts from the University of Maryland, College Park. She is the product of a Christian household and is the youngest daughter of Bishop Vashti McKenzie and Supervisor Stan McKenzie, a former player in the National Basketball Association. McKenzie is also the great-granddaughter of Delta Sigma Theta founder, Vashti Turley Murphy. **Your ticket also gets you a copy of her book, The Engagement Game.